�La Paloma� is a delightful beachfront villa located on the beautiful West Coast of Barbados, just completely renovated and upgraded. 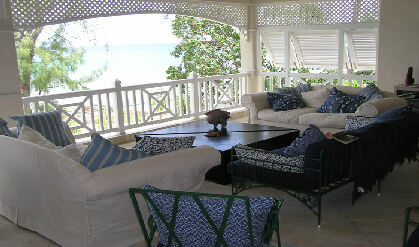 On the upper level there is a gourmet kitchen, dining room and living room terrace facing the sea. On each side of the upper level are two bedrooms, including a master queensize suite, with ensuite bathroom, and three twin bedrooms, also with ensuites. On the lower level there is a 5th kingsized bedroom, as well as a games room. All bedrooms are air conditioned and also have ceiling fans. This property offers magnificent views of the Caribbean Sea and breathtaking sunsets, as well as having good swimming directly in front of it, with great snorkeling opportunities.